Rivers and Roads: believe better things. life is beautiful. it is full of places to go and things to see, but most importantly, it's full of people. people that we are called to love. to pursue. to speak life and truth into. to invest. to build up and encourage. we were made for community and relationship. we were made for each other. i'm incredibly grateful that jesus has brought people into my life who speak truth, who don't back away from the hard conversations, who don't allow me to believe the lies the world and satan want me to believe, who spread joy every where they go, who point out the beauty, who remind me that i am enough, and who, on a daily basis, invite me to believe better things. i hope you have friends like this too, and i hope you are that friend to someone else. happy friday, brave hearts. enjoy the long weekend! I love that quote (is it really a quote since it's so long?! :D )! It is a great reminder that I love to look at from time to time. 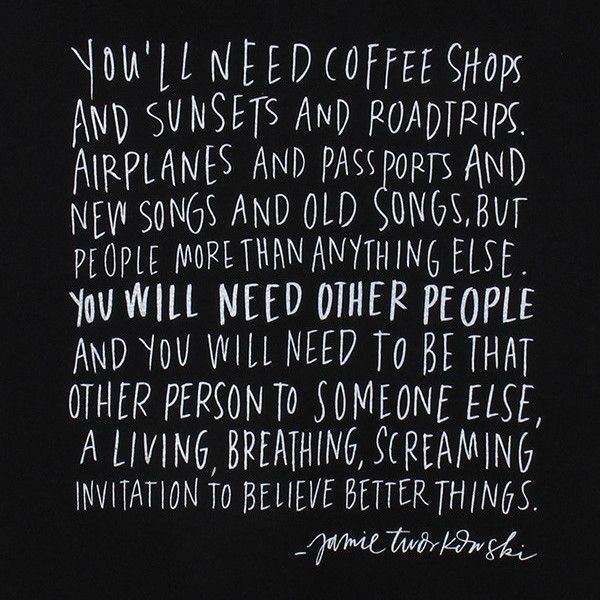 I feel so very blessed that I have people, family and friends, in my life who are my "invitation to believe better things" and I strive to be that person for them too. Have a happy weekend! Love that quote! And love friends to do life with! How awesome is it that God created us to live in a community, a community to fill us up, to pick us up and to lift us up!! such a good reminder! Glad you have people like that in your life. My sister has been that person for me lately. She is full of mercy, truth and kindness. I have pinned this before. i am obsessed. This is so awesome! We spent a lot of time discussing community at our Bible study this past week. I shared that I believed that we're all given weakness so that others can be the strength we need. If we were all awesome at everything and never needed any help, there wouldn't be any opportunity for us to carry each others burdens. I have always loved that quote soooo much! invited to believe better things. Thanks for sharing this friend....my heart needed to hear it! i love this quote! it is amazing. and i am also thankful (SO THANKFUL) for a friend like you! I absolutely love this quote. I don't know if you're familiar with Jamie, but he's an amazing speaker. His organization TWLOHA has been a huge part in my life! Love this so so much. you're welcome! it's such a great reminder! oh, so good! mercy, truth, and kindness...all beautiful things to practice. yes!! i saw it a few weeks ago and just fell in love! it is one of my favorites now! you are welcome!! happy wednesday! i am familiar-ish with TWLOHA, but i did not know about Jamie...just what TWLOHA was. i have absolutely fallen in love with this quote, though! very very good. i'd love to hear him speak! He's the founder of TWLOHA and if you ever get the chance, you absolutely have to hear him speak! It's life changing! all of this to say, that yes, i agree with you. having friends that invest, don't back down, encourage, and live life with you is just....incredible and it is something to be so thankful for! madison was saying what a great speaker he was...now i want to hear him speak! 5 reasons you should switch to Disqus.